Fatima Al-Fihri was an inquisitive Muslim woman who lived in the 9th century.She used her inheritance to establish a center called Al Qarawiyyin. Fatima Al-Fihri was an inquisitive Muslim woman who lived in the 9th century. She was the daughter of a wealthy businessman born during the Golden Age of Islam, a time of flourishing economy and rising cultures. She had a passion for education and knowledge. She also loved to read and travel. Therefore she built a mosque in those times and after the building was constructed, she brought scholars and teachers from all over to spread education. 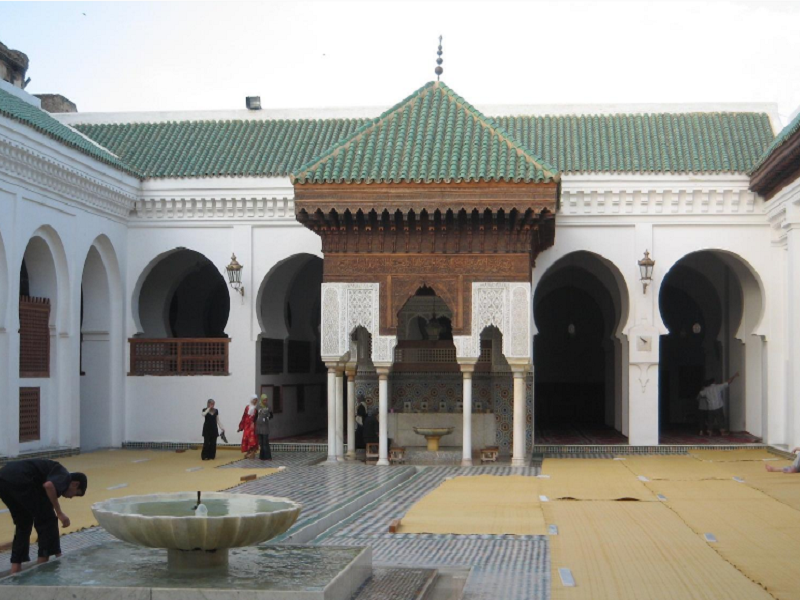 Al-Fihri used her inheritance to establish a center of knowledge in Fez, Morocco, where teaching and learning was of such rich quality, that it went on to become a full-fledged university. It came to be known as the University of Al Qarawiyyin. The University of Al Qarawiyyin moved away to another part of Fez, and only the mosque and the library remained at the ancient complex. In 2012, architect Aziza Chaouni, began renovation on a wing of the university’s library as part of preserving the original UNESCO World Heritage-recognized fountains within the structure and this took three years to complete. Re-building the library wing while managing to artfully reconstruct the world’s oldest library was a Herculean task! But thanks to the ambitious Moroccan-Canadian architect, the University public wing went from a dilapidated state to a state-of-the-art library. The library houses a collection of 4,000 rare books and ancient Arabic manuscripts written by renowned scholars of those times. There is also a 9th century version of Quran written by philosopher Averroes. The library even holds books dating back to very ancient times, more than 12 centuries ago. The library is now equipped with solar panels and a newly designed gutter system. Digital locks to the rare books room and air conditioning that helps to contain the moisture, is put in place, given that the old books are as good as relics. The library was previously open only to university scholars and researchers. But today it has a wing open to the general public, including an exhibition room and a small café. “There has to be a fine balance between keeping the original spaces, addressing the needs of current users, including students, researchers and visitors, and integrating new sustainable technologies — solar panels, water collection for garden irrigation, and so on,” Chaouni told TED.com. These two women are an example in breaking shackles of stereotypes and doing away with the notorious patriarchy of the Muslim community, an ode to a future where women are appreciated for their talent and ideas! Watch this beautiful video about it!